"It looks like it's eating your head...in a good way!" The title would be Kirsten's comment on my parka, which is quite accurate in my opinion. Hahaha, the fur-trimmed hood on this jacket is very...furry. Afterwards, we hit up Macy's, where he helped me hunt down the perfect perfume. Since he's the one smelling me all the time, we figured we might as well pick out one we both like. I'm pretty sure we entertained the girl who tried helping us find a scent - Patrick kept leaning in and imitating a dog when he sniffed me! Haha, but we found a hit eventually with the Viva la Juicy perfume. Mmmm, it's so fresh yet floral. I love it! One thing's for sure - it'll be an untraditional Christmas! We'll just have to celebrate early. Still, it does make me sad to know I'll have to miss out on the special day with friends and family here. Especially since now that I'm listening to Christmas songs, there's that one tune that goes: "I'll be home for Christmas, you can count on me." Ah well, there's still a chunk of time between now and then - right now I have to think about all the homework I've been putting off for this break and get 'er done! I HAVE VIVA LA JUICY WOOHOO we're twinnies Linda! <3 And aww I wanna see an outfit post with Patrick! 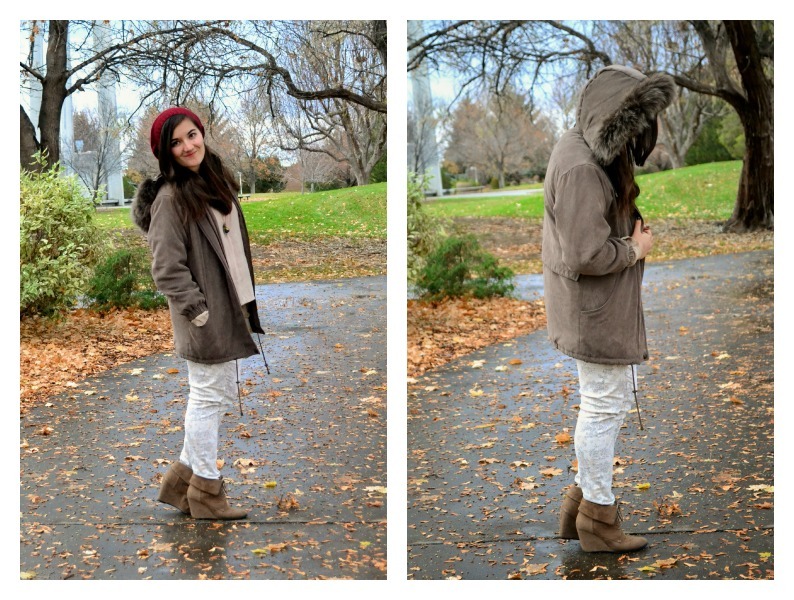 You guys should do a christmas card hehe for the blog :) OR you could match outfits...hmm matching outfit post? is that cliché? nope. i think it would be SO COOL. Oh and I LOVE the floral jeans. You print mix so well with the florals and stripes here. I DIG. HAPPY THANKSGIVING LINDA! And Christmas is on the way--i'm listening to tunes too ! WEEE!!! Enter to win whatever you want from Yak Apparel!! And make sure to check out the other 4 giveaways going on at Wear Abouts! lol You still look super cute! I like your cardigan! Hi dear, this look is really pretty! I love your necklace and floral jeans. love the textures and patterns but that it is still a neutral palette! The jacket looks so comfy and stylish! Love it. Have a great weekend. Anything this furry and cute gets an A+ in my style book, so adorably cozy. Its a great pick to get onto the floral jeans trend. Your Xmas plans sounds actually quite exciting! I am sure it will be a wonderful experience. Love love love your coat!! Wow the Philippines for Christmas- that sounds amazing!! Yur hat does look like it's eating you head but looks amazing- love your jeans. That jacket is the rather voracious creature, consuming your head and all like it is. ;) hahaha! I like that comparison. YER AN ADORABLE LIL ESKIMO GURL. An outfit post with you and Patrick would be adorable. That's so cool that he let you pick some things out for him... omg that would be my dreaam! I would force my man to wear sweater vests and bowties all the time. It wouldn't be a healthy relationship. ANYWAY. oh i absolutely love your jeans and shoes! LOVE the floral jeans! So pretty. That coat is gorgeous too and the beanie tops it off perfectly with that pretty burgundy color. Oh, and your shoes! You literally nailed it from head to toe! loving this cozy and cute look! and again I LOVE your whole outfit! those delicate beige and brown'ish shades are really cute and girly. oh and stripes are always awesome! Lovely outfit, I ADORE that necklace, that is so cute! Love this look, those printed pants and those shoes are perfection, and I'm so jealous of that necklace!! I love your coat! And I definitely agree, Target is dangerous. Too many good deals. It sounds like you're going to have an awesome Christmas! You'll have so much in the Philippines! Looks like such a warm coat, I love those shoes! Buwwahhaa! I think that's the best comment ever, "It's eating your face! But in a good way!" Furry parkas are the best though, so comfy and so warm. And yours looks adorable on you, those printed jeans works so well with the sporty vibe of the parka and add a little bit of fun as well. Lulus.com is offering all Stylishly In Love readers in the US and Canada a coupon code of 15% off site wide discount when purchasing online. The coupon is valid until November 25, 2012 at midnight. This is also a one use per customer coupon. Also, it is case sensitive, so please type in the code in all capital letters. Check it out on my site stylishlyinlove.blogspot.com. Oh, you look adorable! I really love your pants and cardi! Eskimo! So cute! Thanks for the comment! Of course we can follow each other! Let me know when you've followed me so I can follow you back! hahahah Kirsten's comment on the parka is so funny. the park is so cute! I really like all the light neutral colors in this outfit and the print mixing :) AND OMG YEAH Target has so many cool stuff. It was so hard for me to not buy anything but luckily I forgot my wallet hahaha. But ahhh LOVE those jeans, it has such pretty colors and it totally works for spring (and summer) too! cute outfit! i love those pants. Good luck with homework! haha I love the furry jacket- totally eating your head- in the cutest way! Such a gorgeous outfit! I love the neutral colors paired with a pop of red! I'm in love your floral pants and your boots! aaaaa love your style. it's so autumn. Great pants, I dig a winter white! Great jacket too! I really like your blog, what about follow each other? That coat is just perfect! Those pants are awesome and you look great. One of my favorite looks from you. Your look is so creative, my dear! Lovely boots!!! My goodness, you look adorable. Those jeans are so sweet. The print is subtle, but so special. I like that comment about your hood. I couldn't agree more. It's super cute. Also, your necklace is irresistably charming. Hi Linda! love your work...nice autumn outfits! Always nice to look at your style and photos.